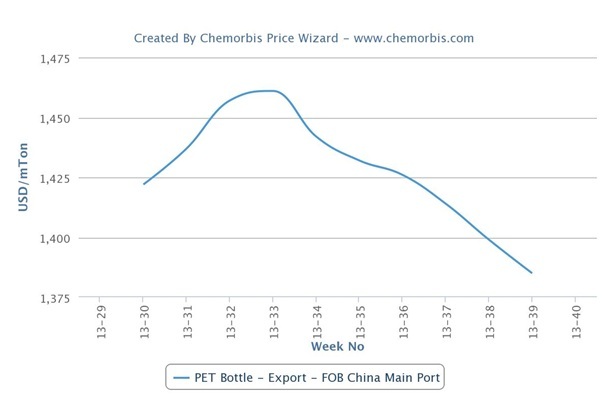 Mediterranean markets, including Turkey and Egypt, saw lower import prices for Far Eastern PET cargoes during last week as per the pricing service of ChemOrbis. China’s absence as the country was celebrating the one week long National Day holiday weighed on global markets. Looking at these markets individually, import PET prices saw $30-40/ton decreases in Egypt while offer levels were $30/ton lower at both ends of the import range in Turkey on a week over week basis. The one week long National Day holiday in China, which started last week, worsened the already unsupportive market conditions in terms of buying interest. Apart from the Chinese holiday, Turkey and Egypt are readying to celebrate the Eid holiday after this week, which will shorten the month of October further and slow down trade. 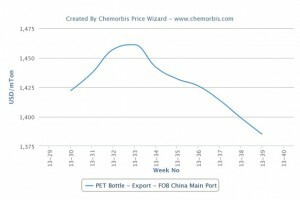 According to ChemOrbis, prior to the National Day holiday, softer feedstock costs, weakening buying interest and rising inventory levels were indicating a stable to softer trend in China. However, producers’ theoretical production costs based on spot PTA and MEG prices were still above the low end of the overall export range. Though weak demand is pulling down prices, theoretical costs still suggest that PET producers are operating with negative margins in that country.